The UK district heating market is entering an exciting phase with increasing support from the Department of Energy and Climate Change (DECC) to develop and deliver networks throughout the UK. DECC currently estimates that if just 50% of projects they have provided feasibility funding for are implemented then this will have a capital value of £800m. There are currently key cities which are leading the way in district heating including Nottingham, Sheffield and most recently Manchester and Leeds. London still remains a key leader with schemes being delivered to the public and private sector which has been supported by the Mayor of London’s Plan, ensuring that all new build developments connect to or develop their own district heating schemes. In a growing market with regulation and funding to support development in both the public and private sector, there is great opportunity to network with proactive organisations to secure project sales and develop your career. When developing opportunities with clients, you want to be able to utilise the company’s credentials, experience, knowledge and capabilities of its people. We have over 330 people dedicated to designing, implementing, operating and maintaining district heating projects with some of the team having been in the UK market for 30 years. The team ensure that the networks achieve their CO2 savings, meet new and existing standards and compliance but also meet the objectives and aims of the client and their project. Integrating our expertise we ensure that our networks provide solutions for today and for the next 50 years. Case studies are a key reference for a client to review our credentials during the initial stages of a project. Having connected over 40,000 homes to district heating, we have a large number of case studies including the King’s Cross Development, Heathrow Airport, and the Natural History Museum. A website dedicated to the products and services we provide is also available to you to access further technical information to share with organisations. Website: www.vitalenerginetworks.co.uk. 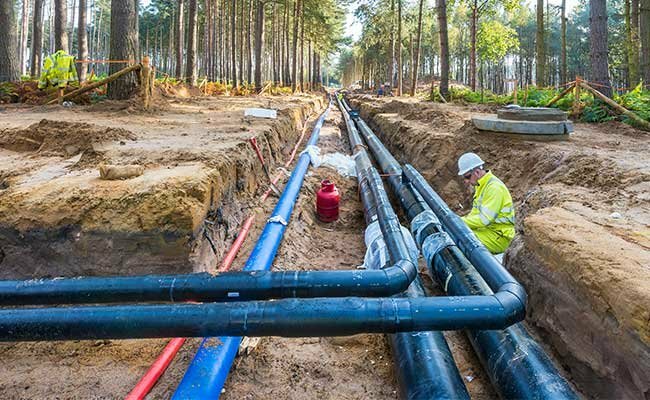 Recent district heating news and project updates can also be found here, for example the recent network completion at the University of Northampton and progress at the University of York. Key members of the Vital team have been invited to actively participate in steering groups to set the standards for best practice. One of these groups is the CIBSE Heat Network Code of Practice which is a standard used by a number of organisations to ensure the highest quality networks are provided. Being part of groups like this and sharing knowledge with industry allows us to continue to innovate and collaborate with our partners who are Europe’s leading pipe manufacturers. If you would like to become part of the Vital family and part of the Business Development team based in London and the South, please email a copy of your CV to ella.stokes@vitalenergi.co.uk. To view the full job description, please click here.